I'm really in love with their leaderboard design, notably the pale gray arrows that show chart movement from week to week. 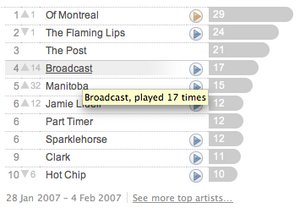 The screenshot above shows that between now and last week, Of Montreal and The Flaming Lips have exhanged #1 and #2 spots, while Broadcast has jumped 14 spots to #4. The charts are just HTML, but every piece of information is linked up, and the display as a whole is quite pretty.